I installed my first outdoor shortwave antenna (a.k.a. SWL antenna) back in the summer of 1971. We had moved from a city apartment to a house that had a big backyard! What a difference that made. Prior to our move, I had been using - and trying all kinds of - indoor antennas since the early ‘60s. 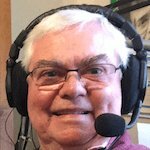 I also obtained my ham radio license in 1972 and have been experimenting with HF antennas ever since. As a result, I have acquired quite a bit of experience with HF wire antennas. I wrote this article to share my knowledge of shortwave wire antennas in particular. If you wish to deepen your understanding, you can get much more background information on how HF antennas work in my eBook series on Amateur Radio HF Antennas. An antenna is like a tuning fork - the instrument used to tune musical instruments, such as pianos. A tuning fork is cut to vibrate at one base frequency only. In practice, it will also emit harmonics - faint sounds that are multiples of the base frequency. These harmonic sounds are much weaker than the base frequency. In fact, the further away they are from the base frequency, the weaker they get. Two tuning forks, cut to vibrate at the exact same frequency, can "communicate" with each other! Put the two tuning forks, a few feet apart, in the same room. Hit one fork to start it vibrating. The other fork will immediately begin to vibrate in response to the sound waves that have hit it after having travelled across the room from the first tuning fork. Note that the "receiver" fork will only vibrate faintly because much of the sound wave energy will have been lost over the distance separating the two forks. Two shortwave antennas that are cut to vibrate at the same frequency will behave like the two tuning forks in my example. For example, the Radio Marti shortwave broadcasting station's antenna will vibrate at a frequency of 11.930 MHz (11,930,000 times per second). That radio station broadcasts in Spanish from Miami, Florida. 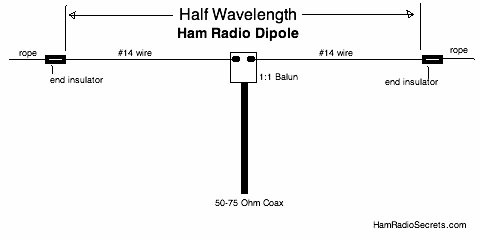 If you had an outdoor half-wave dipole antenna, cut to vibrate at that exact frequency, it would be 39 feet 2 3/4 inches long (11.957 meters long). 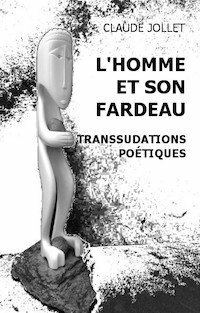 It would vibrate in response to the radio frequency (RF) energy it captures from Radio Marti. Its vibrations would be strongest at 11.93 MHz. Of course your antenna is exposed to the RF energy of other radio frequencies that reach it! But, as it is cut for 11.93 MHz, the RF energy (at that frequency) reaching your receiver will be considerably stronger than all the other radio frequencies to which your antenna is exposed. When you tune your shortwave receiver to receive Radio Marti's programs on the 25-meter band its circuitry is designed to eliminate RF it receives from the antenna above and below 11.93 MHz - to only let you hear Radio Marti. A reminder: at least fair to good propagation conditions must exist for enough RF energy to travel from the broadcasting station to your antenna. When propagation conditions are poor, not enough RF energy reaches your antenna and you will hear nothing but atmospheric noise - with perhaps some stray electromagnetic interference mixed in. Ideally, you would like your shortwave antenna to be equally effective at all shortwave frequencies. The bad news is that such an antenna does not exist! Why? Referring back to the tuning fork analogy, a shortwave antenna will perform best at the frequency for which it is cut for. This is called its resonant frequency. The amount of RF energy captured by your antenna will rapidly diminish as you move away from its resonant frequency. Therefore, all else being equal, stations above and below in frequency will be fainter. However, the good news is that there are ways to install a shortwave antenna that will offer acceptable performance over the entire shortwave spectrum. A quality shortwave receiver will often be able to make up for an antenna's shortcomings (pun intended ;). The shortwave frequencies are generally considered to be the portion of the radio spectrum between 1.7 MHz and 30 MHz (1705 KHz to 30,000 KHz). The frequencies between 525 KHz and 1705 KHz are called medium waves. The lower and upper limits of these frequency bands are only slightly different over the European Continent. A shortwave receiver is only as good as its antenna, no matter how sophisticated or expensive it might be! Therefore, it is worth your while to choose your antenna carefully, be it homemade or commercially made. An outdoor shortwave antenna will always give better results than an indoor one. A random length outdoor wire antenna installed as high above ground - and as far away from buildings and power lines as possible - will generally give quite satisfactory results. The reason behind this is that - like a tuning fork - an antenna will perform best when its size is close to the wavelength of the radio signals it is meant to capture. For example, a half-wavelength dipole antenna cut for reception at the bottom of the 120-meter band (2.3 MHz) would have to be almost 204 feet long for maximum efficiency and effectiveness! It will pick up much less interference from household electric and electronic devices. It will pick up much more radio-frequency energy than an indoor antenna, especially if its size bears a close relationship to the wavelength of the shortwave band you want to listen to. The two advantages above mean that the antenna's signal to noise ratio (S/N) will be much greater than that of an indoor antenna. Any shortwave receiver will always perform better with a high S/N (strong valid RF signals and low noise pickup) at its input than with a poor S/N (weak signal and strong interference). The end-fed "random-length wire" is the most commonly used because it can be strung up in the air between the receiver and a tall support some distance away from the building where your shortwave receiver is located. 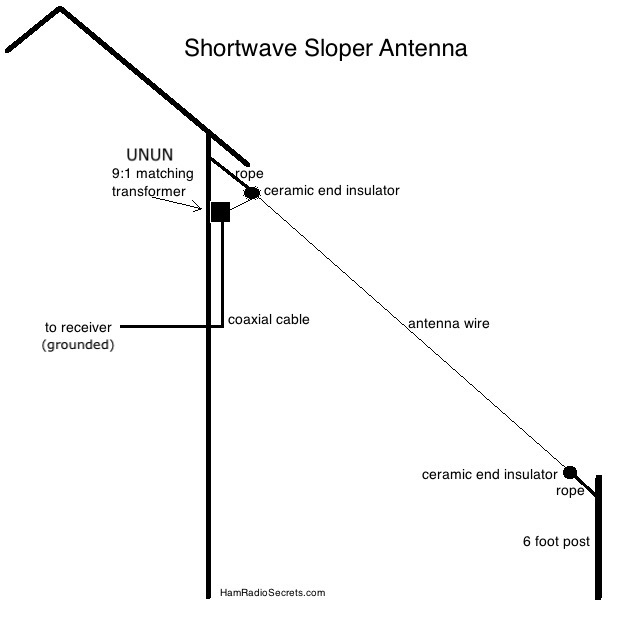 This type of antenna will sometimes be referred to as a "sloper" - because it will often slope down or up from the receiver position. I have found that an end-fed outdoor shortwave antenna - 138 feet long (42.05 meters) - will give very good results over much of the shortwave frequency spectrum. If you do not have enough room for a 138 foot end-fed sloper, try a 67 foot sloper. Even if it is roughly half the length, its performance will only be slightly degraded when compared to its longer sister. It's not the ideal length on all frequencies. It's an acceptable compromise. But not everyone has the available space to install that much wire in a straight line outdoors. Another compromise is to bend it to fit. The wire can zig-zag horizontally - or even vertically - away from your house and still give good results. It means that you will need to support it more than once along its way to the farthest support you have. Just make sure that no given section of the antenna folds back on itself. Ideally, the angle between any two sections should never be less than 90 degrees. Use non-conductive material for insulators where you attach the antenna wire to a support. 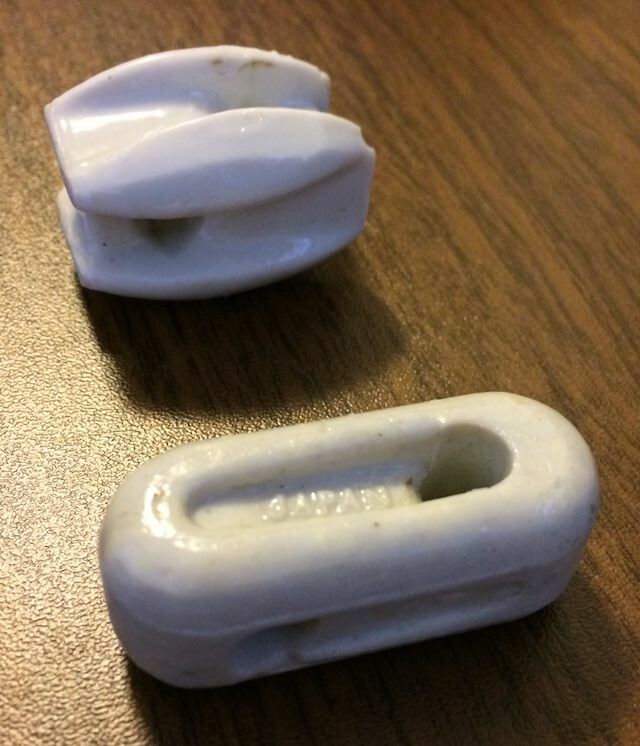 Ceramic or hard plastic insulators work best. I generally use Dacron high-strength rope for my ham radio HF wire antennas. However, I have found that 5/32in. 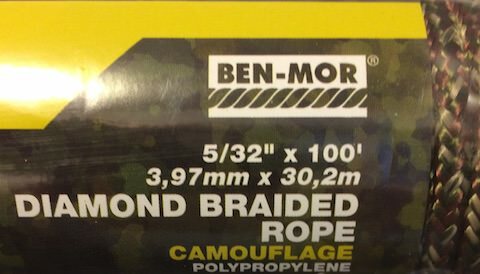 polypropylene diamond-braided rope is quite adequate for less demanding shortwave antenna outdoor installations. well away from power lines. Make sure that the antenna cannot touch power lines - during installation - and that it cannot fall over power lines if it breaks (i.e. during a wind storm or ice storm). As previously explained, outdoor shortwave antennas produce much better results than indoor antennas. Here is a quick overview of commercially made antennas. I will not pretend that the list is complete. Antenna models get dropped and introduced regularly. It will at least give you a good idea of what's available. The following discontinued shortwave antenna brands may still be available online and in flea markets. 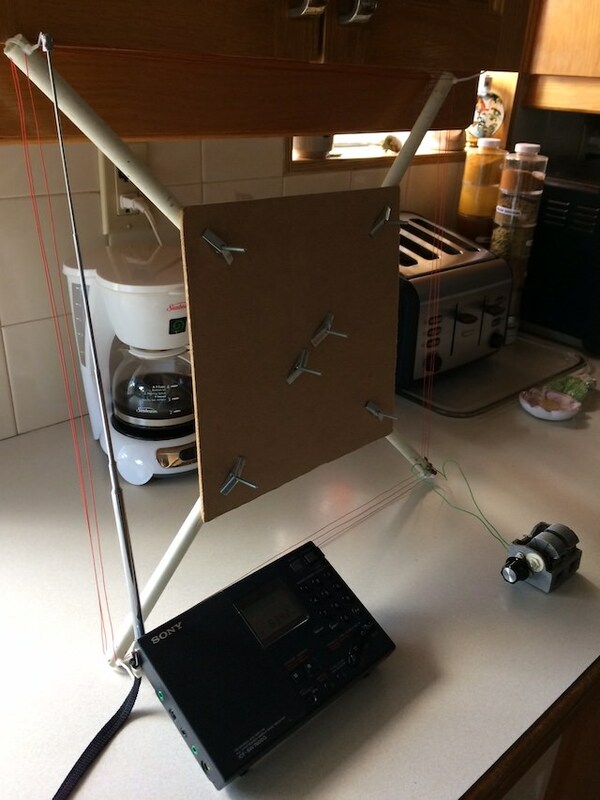 The indoor shortwave antenna is a compromise when you cannot install an outdoor antenna. Even then, a small indoor loop antenna - installed temporarily out on the balcony when you need it - is better than an indoor one. Here are the main types of commercially made indoor shortwave antennas - from the least performing to the best performer. 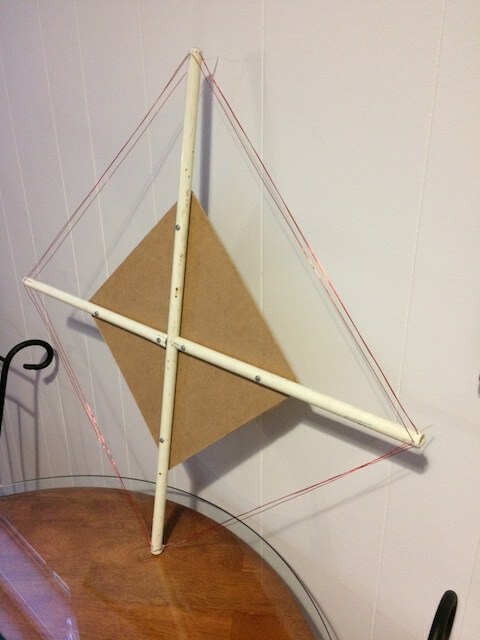 For those of you who like to tinker with antennas, allow me to suggest one of my favorite designs: a small tuned loop antenna. Actually, it could also be called a tuned coil antenna because of its dimensions and construction characteristics. I have built two such antennas. one covers the lower frequency shortwave bands of 120 meters to 41 meters. the other covers the upper bands of 41 meters to 11 meters. I only describe the one for the lower bands here. Note that my two antennas overlap on the 41-meter band. It was just more practical to build two antennas to cover all the shortwave broadcast bands. A single tuned loop would have required a complex switching arrangement which would not have been easy to reproduce at home. The tuned loop antenna is more effective as a shortwave antenna when its width/height dimensions are a larger portion of the wavelengths it is intended to be used for. In simplified terms, the larger tuned loop antenna captures more RF energy than a smaller one. 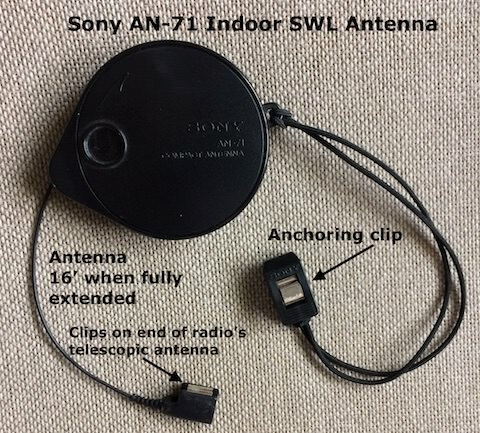 Here are the details of the indoor tuned loop SWL antenna that I built for the lower frequency bands 120 meters to 41 meters. one single-section 365 pf air variable capacitor (salvaged from an old AM broadcast radio receiver). 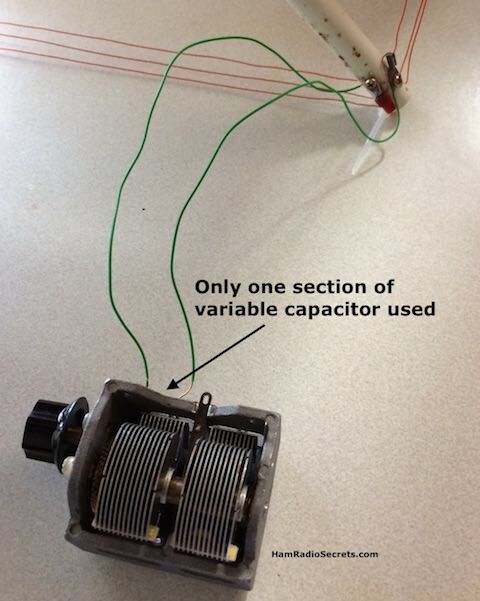 Variable air capacitor of the tuned loop shortwave antenna. slip the other ends of the hookup wires under each terminal screws of the tuned loop and tighten (just enough so they make good contact - if you tighten too much, the screws will become loose and the wires will not make good contact with the spade lugs). SWL setup with SW receiver antenna near the tuned loop shortwave antenna. Turn on your shortwave radio (mine is a Sony ICF-SW 7600G). Extend its telescopic antenna and place it near and parallel to one side of your homemade tuned loop shortwave antenna. tune-in a broadcast station within the frequency coverage range of your antenna (mine covers 2.3 to 7.6 MHz). Choose a weak station to better witness the effect of the tuned loop antenna. Slowly rotate the variable capacitor knob. The tuning is very sharp. You should suddenly hear the station's signal pop stronger at some point. Tuning the antenna is made easier if your shortwave receiver is equipped with a signal strength meter. Here is a truly handy software application that I use to make my shortwave listening more productive. If you cannot install an outdoor shortwave antenna, and you are not satisfied with the performance of indoor antennas, even the active ones, then you could satisfy your SWL interest by listening to software-defined radios (SDRs) that enable listeners to tune in shortwave broadcasting stations.